INDIANAPOLIS, Feb. 4, 2018 – USA Gymnastics has selected the acrobatic gymnasts who will represent the USA at the 2018 World Championships, April 13-15, and World Age-Group Competition, April 4-10, in Antwerp, Belgium. 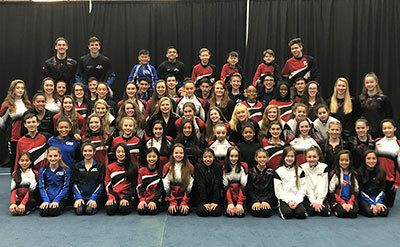 The teams were determined following the conclusion of the World Team Trials at the Texas Academy of Acrobatics and Gymnastics (TAAG) in Baytown, Texas. The World Team members are: mixed pair - Aisley Boynton and Sean Obley, Realis Gymnastics Academy; women's group - Elanor Chang, Calista Davis and Madison Freed, Emilia’s Acro Gymnastics and Cheer; and women’s pair - Emily Davis and Aubrey Rosilier, Acrobatic Gymnastics of San Antonio. The gymnasts going to the World Age Group Competition are listed below. The members of the World Championships and World Age-Group Competition were determined in accordance with the appropriate selection procedures, which are available here.